The group that I belong to is having a contest this month to see how many Red, White and Blue baby items we can make for our troops babies. Now as you know, I study with the Jehovah Witnesses and they are against anything that is patriotic. Well I have always been proud of my country and have not yet decided that supporting our Military is a bad thing. I am not a baptized Jehovah Witness but I do believe many, many of their beliefs. 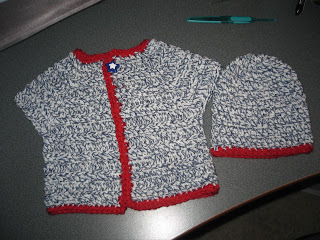 But the Patriotic one is hard for me to grasp so until I do accept it I will continue to make for the babies. That is so nice, Scarlet, especially as a set. I am curious as to why the Jehovah's are against patriotism. Guess I'll have to look that up. Beautiful job sis, so very darling. A lil trooper will look wearing that for sure.